Podemos Suffers Set Back in Catalan Elections. This morning the Spanish radio was full of the fall-out, and the ‘fractures’, resulting from the results of the Catalan elections. The Significance of the Catalan Elections Montserrat Domínguez. The pro-independence front loses the referendum. The anti-independence forces account for 52 percent, compared to the secessionist bloc’s 47 percent. It’s inconceivable that with these results, once the the cava wine bubbles evaporate, any serious politician (in Catalonia) will propose a unilateral declaration of independence. That would be undemocratic. But it’s the first time that the option to secede takes such flight: more than 1.9 million votes is a cry that no serious politician (in Madrid) can ignore. In the polls, Ciudadanos breaks the roof: it tripled the results of the previous elections and, with 25 seats, stole the spotlight. The Sorpasso (overtaking) of the People’s Party (PP) in Catalonia is a warning: will this happen again in the general elections in December? We will never know what result Albert Rivera would have achieved if he had been the candidate of the Generalitat, the Catalan government; but being the second force in Catalonia gives wings to his aspirations to get to the Moncloa Palace. The PP is increasingly irrelevant in Catalonia: it lost 10 seats, including Badalona — where Xavier García Albiol was mayor — which went to Junts pel Sí. It’s a real slap in the face for the party and its campaign strategy. Today, there is a cold wind in Moncloa and Genoa street: Rajoy is proving to be incapable of facing the challenges in Catalonia. After a spectacular gain (from 3 to 10 seats), CUP now has the key to governance in Catalonia. If it fulfills its promise of not voting for Artur Mas as president, Junts pel Sí will be forced to come to an agreement on another candidate… and internal battle is guaranteed. When 77 percent of Catalan citizens vote, the message is strong and clear. The pro-independence front, which brings together Junts pel Sí (Together for Yes) and the CUP (Popular Unity Candidacy) party, earned a clear majority in the Catalan parliament, winning 72 seats. It now has the legitimacy and strength, said Artur Mas, to keep pursuing its dream of secession. r of votes as in the last Catalan elections — after the internal bleeding and the appearance of new parties that contest their ideological territory — justifies Miquel Iceta’s sigh of relief, despite having lost four seats. And those half a million Catalan votes are worth their weight in gold in Pedro Sanchez’s race toward the Moncloa Palace. Pablo Iglesias ha construido alrededor de Podemos una épica de partido ganador que ayer, tras lograr en las elecciones catalanas un resultado que sus propios dirigentes consideran decepcionante, sufrió el mayor revés desde su nacimiento. Pablo Iglesias has built around Podemos an epic in which they are the winning party. But yesterday, after the results of the Catalan elections, which their own leaders considered disappointing , the party suffered the biggest setback since its birth. We should observe that Podemos (link to their site here) did not go it alone this time. Inside Catalunya Sí que es Pot (CSQEP) they were allied with Iniciativa per Catalunya Verds (Red Greens), and Esquerra Unida i Alternativa, (the more directly linked to the left bloc, Izquirda Unida). This in itself is a step forward for a group that appeared to wish to ‘go it alone’ to the extent of organising, its own demonstrations against austerity rather than create united fronts. Iglesias has announced today (Iglesias ofrece un referéndum catalán en el que pediría el ‘no’) that if Podemos wins the nation-wide general election he will offer a proper referendum to the Catalans, in which his party will campaign against the separatists and for a multinational and pluralist Spain. Inside Podemos some have criticised the alliances that they made in Catalan with left-wing and Green forces, declaring that people did not understand the “alphabet soup” (CSQEP) that resulted on the ballot paper. It will be interesting to follow further developments. Enthusiasm for Podemos on the European Left, including Britain, was until recently widespread. It was accepted that the party had managed the difficult feat of giving a political voice to the indignados movement. That it has built a ‘populist’ constituency through language and demands that welded together the 99% against the 1%. That it used the (in Laclau’s words) ‘floating signifiers’ of the ‘people’ (crushing majority) against the Spanish ‘casta’ and had created a democratic organisation capable of challenging the rule of finance and the dominance of economic austerity. It is new, it uses the Net, it encourages direct communication not tired old bureaucratic structures, or divisions between the historical left and right. There is little doubt that there is a great deal of political fluidity in Europe today. Movements to break up existing states, often from the wealthiest regions of a country (as in Catalonia or in Italy with the Lega Nord) tired of paying for poor and apparently lazy ‘southerners’ , appear part of this process. The strong showing of the Catalan sovereigntists was welcomed by forces from the Scottish National Party, promoting the interests of their ‘ain folk’ against ‘Westminster, the hard-right Nieuw-Vlaamse Alliantie (Belgium), who dislike the former industrial French speaking and Socialist voting Walloon, and some leftists – the latter apparently convinced that Barcelona tax-payers are right not to want to subsidise their feckless compatriots. Podemos may, or may not, be capable of offering what Mason (in the most significant part of Postcapitalism) calls “revolutionary reformism”. Mason’s list of ideas, a third managerial revolution, switching off the neoliberal privatisation machine, suppressing or socialising monopolies is attractive. But everything depends on a political vehicle to implement them in a recognisably effective form. That is, the need a political forces capable of reaching and transforming existing political institutions. They have to connect ‘giving voice’ to protests, social interests (not least the labour movement) and being capable of administering solutions. They need parties. In the case of Podemos this, which Ernesto Laclau called the “moment of articulation” – that is the details of how political parties operate – is becoming unstuck. No doubt the ripple effect of the defeat of Syriza’s anti-austerity programme counts for much in their present impasse. They may have woven ‘floating signifiers’ together, but what anchors them? Podemos’ vaunted horizontal democracy (apparently giving shape to Mason’s ‘networks’) is paralleled by an internal structure, built as a pyramid around a leader. This is deeply problematic and pretty much casts its claims to novelty to the dustbin. Iglesias has as El País indicates, a self-defined “epic” in which he will valiantly take on the Spanish ‘casta’. Like a figure in the Game of Thrones (a box set of which he generously donated to the Spanish King Felipe VI) he is surrounded by intrigue. He finds it hard to work collaboratively. Forced to accept alliances with other forces, like the Green Equo and the long-standing Izquirda Unida, he has the ill-grace to refuse to take any joint responsibility, in the political battles. Now that it is clear that Podemos has not the remotest chance of forming a future government in the Cortes Generales it will be of interest to see how his authority is maintained. * Ideologically, C’s describes itself as a progressive, secular, constitutionalist, European federalist and postnationalist party. In addition, Albert Rivera has said that C’s defends autonomism. According to its declared identity signs, C’s advocates four basic lines of action: Defence of individual rights. Defence of social rights as well as the welfare state. Uphold the State of Autonomies and Europe’s unity. Regeneration of democracy and of political life. Wikipedia. 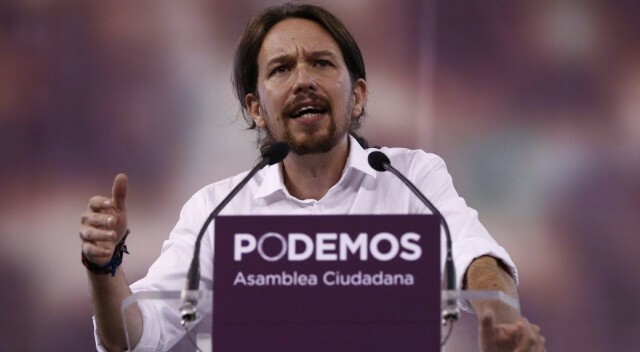 Pablo Iglesias Backs Jeremy Corbyn, but Podemos is less and less a model for the Left. On Downward Slide in Opinion Polls. Podemos leader Pablo Iglesias held a press conference on Monday to mark the end of the summer holidays, as Podemos supporters launched a campaign to make #PabloIglesiasToMoncloa the top trending topic on Spanish Twitter, in reference to Moncloa Palace, the Spanish Prime Minister’s official residence. “We are out to win the election”, he said. A poll published earlier on Monday showed Podemos in line for 11.94% of the vote or 30-34 seats in the 350-seat Congress, in third place behind the Popular Party (PP) and the Spanish Socialist Party (PSOE). Mr. Iglesias rejected the idea of a coalition deal between the Spanish Socialist Party (PSOE) and Podemos after the general election as “absolutely unlikely”, although he did not rule out “decentralised dialogue processes” with new alternative left platforms such as Ahora en Común. He added that Podemos now believed the general election in Spain would take place “in December”. Regarding the early regional elections in Catalonia, which will take place on September 27, he said he believed the Podemos option there, “Catalonia Yes We Can” (Catalunya Si Que Es Pot) was the “only option” that had a chance of beating the First Minister’s joint pro-secession electoral list: “Our main aim is to beat Artur Mas”. He also said the rise of Jeremy Corbyn was “very important” in the race to lead the Labour Party in the United Kingdom, helping it to remember its roots. “What is happening in the United Kingdom, I insist, is very important. A different Labour Party, that gets its party origins back as a representative of the popular classes is, I believe, very important”, suggesting Angela Merkel now represented “the past” and that alternative left parties were the future. One of Mr. Iglesias’s European parliamentary assistants later tweeted that Podemos supports Jeremy Corbyn “because we understand he is an ally in changing the constitutional architecture of Europe”. While Iglisias’ backing for Corbyn is generous, we sincerely hope that people on the British left would stop comparing themselves with Podemos. The leadership of Iglesias has been most recently in trouble over his attitude to the rest of the Spanish left (indeed over whether the party should be ‘left’ at all) followed by disputes over Podemos’ stand on Catalan independence. Their downward spiral was described yesterday in El Mundo by Casimiro García-Abadillo ¿Por qué se desinfla Podemos? Naturally we would not credit this daily, or its journalists, with any sympathy for the Spanish left, but some points made are important. García-Abadillo begins by noting a higher figure for Podemos than Spain Report, 15,7%. But the most significant aspect is the drop from 23,9% in January (and, we could add, around 30% at points last year). The shift to pragmatism (the “leftist populism,” Iglesias represents), conducted with the aim of disputing the hegemony of the PSOE left, disappointed some of its electorate, linked to 15-M (that is, the original Indignados). These has created internal strife, led by figures such Teresa Rodríguez and Pablo Echenique. This ideological tension thas demobilised many of his followers, as highlighted by the low turnout in the primaries (something we have noted on this Blog). The ideological uncertainty extends to issues such as the independence of Catalonia. This generated confusion among potential voters. Essentially, Podemos has failed to stand for a genuine leftist movement that has nothing to do with nationalism. The compromise position adopted on secession has created tensions within the party in Catalonia and has likely discouraged many citizens from other regions who reject granting privileges to the richest part of the country (Catalonia) for sealing off its privileges in autonomy, if not independence. The experience of coalition government in municipalities and communities following the elections of 24th of May has been somewhat disappointing. The case of Madrid is well known and covered on this Blog. The debate on electoral alliances. El Mundo blames the “opportunism” Podemos has shown. We by contrast would blame the “new age sectarianism” of the “post-left” that thinks it can dismiss the Marxist forces of the Izquirada Unida and the Greens of Equo. The effect of the failure of Syriza in Greece, or more simply its defeat faced with the power of Finance – which are too obvious to dwell on. Podemos had a strategy which many people on the left across the world admired. To mobilise this strength Podemos claimed that it needed an approach that was “beyond” the left/right division. Words that apparently move “beyond right and left” and connect with real experience focus on the key element in Podemos’s public discourse: mobilisation against the ‘casta’ – the political ‘caste’ or elite. 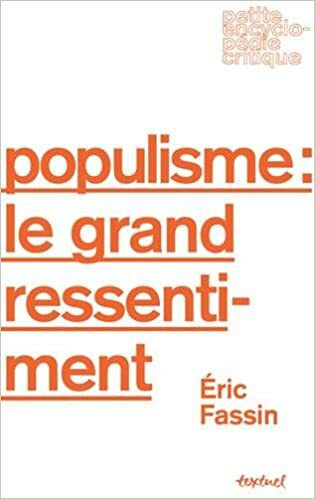 In On Populist Reason (Verso, 2005) Ernesto Laclau described the shifting way the “popular” is constructed. A populist party is, he argued, built around “empty signifiers” – that is symbolic points around which the conflict between the “people” and the “elite” is created. Podemos is so famous for having woven its discourse around opposition to the “casta (caste)” -the political ruling class – that the, having fixed it, quilted it, wrapped itself around with it, it would, at some point, fray. It was perhaps predictable that once it became identified – symbolically and in reality – with those who rule, that is take office – it would face problems. Ciudadanos deprives Podemos of its novelty effect and, above all, its appearance as the only contender to the throne that bipartisanship has already semi-abandoned, around which a heterogeneous social majority could be built, attracted to Podemos by the real possibility that it was the vehicle for political change. It is a vicious circle, because as a victory for Podemos seems less possible, the less support it will receive. And, on the contrary, the more credible the victory of an alternative, the more instrumental support it will receive. Although both parties are vying for only a layer of votes and their major potential voters come from counter-posed sites, Ciudadanos blocks the growth of Podemos in the less politicized and more conservative sectors and fires a torpedo at the waterline of its project of a transversal party which aspires to quickly accumulate a social majority that goes beyond the traditional confines of the “people of the left”. Josep María Antentas International Viewpoint. Podemos has also moved rightwards, dropping, notably, plans for a universal ‘Citizen’s income and tempering its anti-austerity plans with a degree of realism – such as proposing that debtors and creditors negotiate mortgage payments, instead of advocating the suspension of all such foreclosures as it did previously. These difficulties have been worsened by the existence of another ‘populist’ element, a charismatic leader who holds the party together and takes the decisions. How Iglesias has been insulated from political difficulties – opposition – is indicated by Podemos’s adoption of an inner party structure that gives “winner takes all” power to the leadership. That is despite claims that it is “horizontal” and based on intimate “circles real decision-making is made by one circle; the Leader’s. His dislike of the ‘old’ left is unfortunate in that every political ideology becomes – pretty rapidly with today’s communication systems – ‘old’, old enough to remind people of earlier attempts to move “beyond” left and right, with their mixed results. There are few signs that Iglesias or his Courtiers has found a way out of the problems posed by ‘populism’ – a shifting social base, a drift with the tide of opinion, and the ‘charismatic’ tendency to ignore the advice of others. Is Iglesias’ Leadership of Podemos Beginning to Unravel? Podemos Leader Faces Challenging Times. The Left Alternative challenges Iglesias’s plans for the General Election. Under the name Ahora en Común, a group of the left of Podemos have, on Thursday, set in motion an initiative to promote “popular unity” for the general election, candidacies in the style of the’ ‘ciudadanas’ citizen-city lists (governing in Madrid, Barcelona and Zaragoza. The platform, with the backing of Podemos office holders, Izquidra Unida (IU – united left, groups based on democratic communists and radical left socialist and green groups, formerly the largest left alliance in Spain) and those from these lists, is a setback to the strategy of Pablo Ingelisas , who wants the other forces of the alternative left to join behind him, under his “umbrella”, for the election. IU’s candidate, Alberto Garzón, whose own proposals for unity have already been rejected by Iglesias, has welcome the proposals. The manifesto was signed by representatives of Podemos, candidates of “popular unity”, the United Left (IU) and Equo (Spain’s Greens). These include Jorge Suarez, mayor of Ferrol (Ferrol in Common), Isidro Lopez, deputy in the Assembly of Madrid, Diego Pacheco, a member of the regional management of the organisation in Madrid, Rosa Martinez, spokesperson for Equo, Pablo Carmona, Councillor for Ahora Madrid, Mauricio Valiente, former candidate of IU Madrid and Councillor also now Madrid, IU MEP Javier Couso or Eduardo Garzon, economist and brother of the candidate of the d’ederación de izquierdas’ (federation of the lefts), Alberto Garzón. You can see the – growing – list of those backing Ahora en Común (Now, Together! ) here. Iglesias’s response has been to say that he does not need unity between parties, but unity between people. “El líder de Podemos afirma sobre la plataforma ciudadana que “la unidad popular no es la unidad de partidos, es la unidad de la gente”. (El Diario). Presumably behind, himself, and his leadership of Podemos…..
For the past year, they have positioned themselves as allied agents of a change sweeping across southern Europe. On the face of it, Spain’s leftwing anti-austerity Podemos party should have been crowing at the landslide victory of the no vote in Sunday’s Greek referendum. But while Podemos leader Pablo Iglesias was quick to praise Syriza and Greek prime minister Alexis Tsipras, his overriding message was a simple one – Spain is not Greece. With a general election due in Spain by the end of the year, Iglesias, whose party made substantial gains in local elections earlier this year, was careful to mark the differences between the two countries, worried, analysts said, that any worsening of the situation in Greece could drive crucial middle-class voters away from his party. Reinforcing the differences between the countries dampens the idea of contagion, he said, and maintains the party’s appeal to moderate voters. The latest polls show Podemos is in a virtual tie with the governing People’s party and opposition Socialists. Podemos must walk a fine line when it comes to Greece, said José Ignacio Torreblanca, the author of Asaltar Los Cielos, or Storm the Heavens, which explores the rise of Podemos. “On one hand it’s good news for them, because the message of the people having voted against austerity strengthens their message. The frame for them is fantastic because its the people against the troika, David against Goliath and the weak against the powerful,” he said. A video of left-wing Greek leader Alexis Tsipras snubbing his Spanish left-wing counterpart Pablo Iglesias has gone viral on social media. Whether Tsipras intentionally snubbed Iglesias is not known. 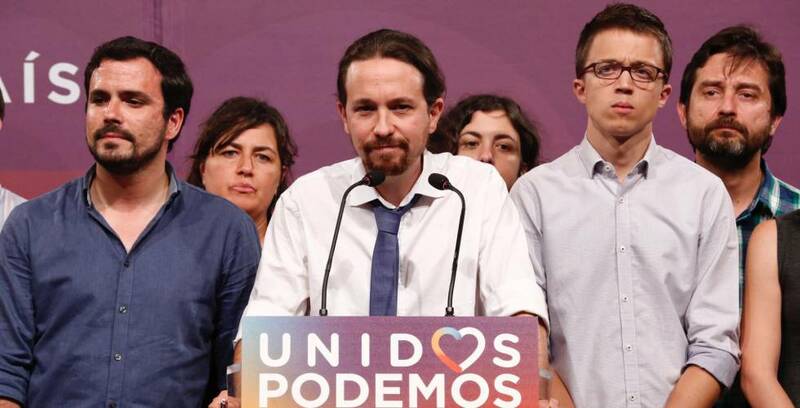 Podemos: A Monolithic, Vertical, and Hierarchical Party? Monolithic, Vertical (Top-Down), and Hierarchical Party? The Podemos ‘convention process’ (consolidating the new party’s structures) which began on September the 15th, ended on Saturday, November the 15th with the election of Pablo Iglesias as General Secretary. He won 88.7% of the votes cast (96.9% valid). His list won the 62 posts for the ‘Citizens’ Council’ and 10 for the Safeguards Commission. Reports Ensemble. (Podemos : un parti monolithique, vertical et hiérarchique ? 22 November). The numbers of people abstaining and can be attributed in part to the ease of “affiliation” to Podemos – by free on-line registration, something which does not require a great deal of motivation or commitment. But it is also due, in large measure, (as indicated by the blank ballot papers) to a growing malaise and disillusionment with the way the Pablo Iglesias team have operated and taken decisions. The ‘technical team’ or administration (elected in April on the basis of closed lists), is equally dominated by this group ….. The team Sumando Podemos, who had formed a partial list of 22 candidates, announced its withdrawal after examining the closed list voting system – by which one can only select – through a single click – a single slate Added to this is the decision of the team Claro Podemos to present a complete list for all the internal party bodies. As explained by MEP Pablo Echenique, a member of Sumando Podemos, (1) ” the voting system and the fact that the list of comrades from the team Claro Podemos was complete, made it extremely difficult – if not impossible – that a person who was not on the list to enter the Citizens’ Council. I think – we think – that it’s a mistake to set up a voting system in which mathematics decide as much as the people. ” According to the predictions of Echenique, the effects of system and blocked list were obvious. They are clearly reflected in the sharp difference between the votes received by candidates at 62 (75’131) and 63 (5’337) for the Citizens’ Council and for candidates in 10th (73’955) and 11th ( 4’697) position to the Oversight Commission. Because of Pablo Iglesias’s media fame and this voting system, the possibility of access to the internal party bodies was strongly conditioned by the prior inclusion on his list. This method largely distorts the open primary system and has reproduced in practice the “dedazo” system [from “finger”, dedo, a term which defines the practice of the holder of an office or a term designating successors without going through any democratic procedure]. Criticism of the traditional parties ruled by a “caste” (the political ‘class’), bound by loyalty to the leader who rules as an individual, has been offered in the past. But in fact the closed list pushes to an extreme limit the effects of the (traditional) majority system. The list that receives the most votes wins control of everything – in contrast to claims (made by Podemos in the past – TC) for greater proportionality in the electoral system. It is certainly not effective against careerists who have torn up their old party card and joined Podemos in order to pursue their own interests. This has, however, meant the immediate exclusion of militants from Izquierda Anticapitalista (IA) from the party’s internal bodies, despite the fact that IA not only does not compete electorally with Podemos, but played a key role in the initial design and foundation of the organisation. The result of this process of formalising the structures of Podemos is that the party has changed its organisational character. It has adopted the format of a monolithic party one whose structures are top down and hierarchical. Power is concentrated to an extreme degree in the hands of the General Secretary who has the ability to appoint the executive, while its internal organising committees have been co-opted by a single list. This even includes the Control Commission (that exists to guarantee the rights of members) which should self-evidently be a plural and independent body if it is to carry out its functions properly. These rules make it difficult for a pluralist and democratic internal life to develop.. Indeed, they consolidate a plebiscitary presidential model for Podemos – something which means that it has moved away from its previous course not to say its entire original basis. The truly open ‘primary’ elections with independent candidates that operated for the European elections are now consigned to the past. More distant is the foundation of Podemos as a plural and unitary organisation of candidates. That is was born with the intention not to empty or dissolve existing organisations, but to aggregate in a common front groups and sectors not previously organised or mobilised, using mass and civic engagement so that people who are politically active act on their own initiative. Equally distant is the political culture that emerged after the eruption of 15M, characterized by mistrust of celebrity politics and the leadership of individuals. Claims to an open and collective organisation, common decision-making and consensus, direct grass-roots participation are also now history. From David Lloriente. Published November 22, 2014 on the site of Viento Sur. From the translation by Encontre. Original: Proceso congresual y mutación organizativa (which the above is checked with). We should point out this is the point of view of the Izquierda Anticapitalista who are aligned with the Fourth International and the French Nouveau parti anticapitaliste (NPA). But (1) Sumando Podemos (going beyond Podemos, surmonter in French is a more appropriate translation I feel, even literally ‘addition’ is the direct meaning in both English and French) is not Trotskyist as such. It is grouped around the famous scientist Pablo Echenique, though is close I learn to IA it is not identical. See: Los críticos de Podemos valoran no participar en las primarias. Note the following: 28th November. (Reuters) – Spain’s newest political party Podemos, riding high in opinion polls just 10 months after its launch, released an economic manifesto on Friday that rowed back on earlier pledges to cut the retirement age and default on the national debt. Podemos (“We Can”) has ridden a wave of anti-establishment sentiment, and polls for two leading newspapers have said it is on track to win the next election, which conservative Prime Minister Mariano Rajoy must call by late next year. Another, larger, survey said it was likely to come a close third. The party unexpectedly captured five seats in May’s European elections, and its rise is worrying international investors at a time when Spain is emerging from the worst economic crisis in decades. “We don’t believe it is the right time to open up a wide spectrum of desires, but rather to propose what could effectively be done immediately,” Podemos said in the 68-page document, which reflects a change of tack as it builds up its party structure and gears up for the election. The new manifesto outlines 79 measures, which will now be discussed with party members and experts before becoming a program for government. Among them are a tax reform that would shift the burden from labor to capital and increase tax rates for the wealthiest. The working week would be cut to 35 hours from 40, the minimum salary and pensions would be raised, but the retirement age would be left at 65 instead of being cut to 60. Podemos has also moved away from nationalizing Spain’s main utilities and now only plans to regulate them more tightly and control competition and price-setting in sectors where former monopolies still hold a strong grip. The most controversial step of defaulting on Spain’s debt has also been watered down. While the party still calls for its restructuring, it says it would only do so after holding talks with European peers and creditors. Update (signaled by PD): This is an important article on Podemos putting forward a very different judgement about their ‘anti-politics’. Understanding Podemos (1/3): 15-M & counter-politics. Pablo Iglesias (PODEMOS): Gets 51 Votes as Candidate for President of European Parliament. A Respectable 51 Votes Yesterday. “The exceptional political situation today in Europe requires not more of the same failed policies, it requires an exceptional response. Perhaps the most important lesson we can draw from the European Election results is that citizens all across Europe have rejected the status quo. People have seen that the neoliberal economic model based on greed, free market principles, and the protection of financial interests at all costs is responsible for the ravaged economies in periphery counties, particularly in the south of Europe. Hard fought for gains have been swept away: social rights, democratic principles, equality, and popular sovereignty. “Podemos (meaning “We can” in Spanish) is a Spanish political party created on 11 March 2014 by Spanish leftist activists associated with the 15-M movement that emerged from the 2011–12 Spanish protests. Its defacto leader is Pablo Iglesias Turrión a writer, professor of Political Science at the Complutense University in Madrid and occasional Spanish television presenter for a regional political discussion program Fort Apache. 1. Recovering the economy places emphasis on public control, includes poverty reduction and social dignity via a basic income for everyone. It includes lobbying controls and tax-avoidance remedies for large corporations and multinational organisations, as well as promotion of smaller enterprises. 2. 3. 4. Promoting liberty fraternity and equality is about breaking down barriers across Europe and allowing people to cooperate fairly without either intelligence gathering or social inhibitions which are notionally ‘counter-terrorism measures. 5. Redefining Sovereignty implies revoking or curtailing the Treaty of Lisbon, abandoning memoranda of understanding, withdrawing from some free trade agreements and promoting referenda on any major constitutional reform. There was a significant article in Le Monde yesterday on Pablo Iglesias and PODEMOS L’«indigné» espagnol qui veut bousculer l’Europe. We await its equivalent in the mainstream English language media. In the meantime International Viewpoint published this highly informative analysis of Podemos The rise of Podemos by Guillem Murcia. In the European election Podemos got 8% of the vote (5 MEPs). The other left bloc Izquierda Unida, got more votes than Podemos, at 10% (6 MEPs). As one can imagine there is plenty of scope for controversy to explore there. Podemos, frente al reto de decidir qué tipo de democracia interna desea. Here is the Podemos official site. Spain: some good results for the Left. Good results for us lot in Spain. The big story of the night were the many smaller parties. Newcomers Podemos (We Can), a political movement that emerged from Spain’s indignados, earned 7.9% of the vote, enough for 5 seats. “We can’t talk about the end, but we can talk about the beginning of the end of bipartisanship. We have to throw them out because they’re the one who have ruined the country,” Podemos leader Pablo Iglesias told journalists on hearing the results. The leftwing coalition United Left increased their seats from 2 to 6 while the Union, Progress and Democracy went from 1 to 4 seats.